Yesterday we started our experiment. Some of the most important pieces of equipment we’ll use are corner reflectors – if you took a cube of metal and cut one of the corners off, it would form a corner reflector. These are very reflective for radars so we use them as reference points. 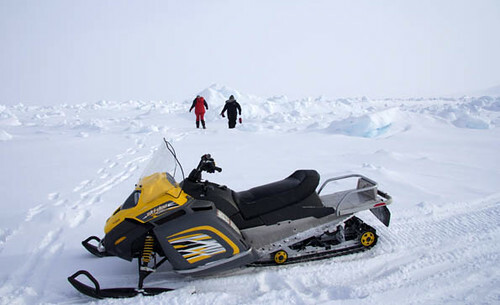 We constructed wooden stands for the corner reflectors and took them out into the field on skidoos, to a site on the fast ice off the coast a few kilometers from Alert, near a CryoSat track. The temperature was around –30°C and the visibility was not great. 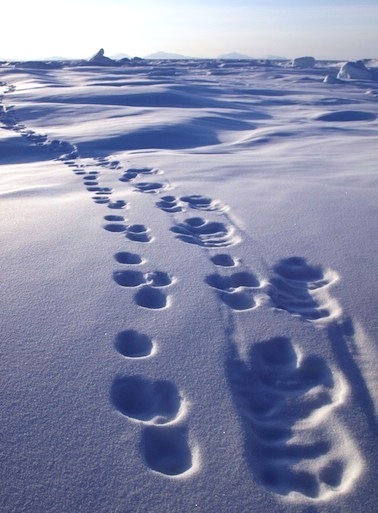 We saw many animal tracks whilst out on the ice including a polar bear and cub! When the visibility improves we will also go further off the coast in a Twin Otter aircraft and set up more sites further away from land. This will be useful to have experimental results in ice more typical of the Arctic Ocean ice cap.